As a species, we tend to have desires for things we know to be utterly rubbish, even when we know that they are indeed terrible. It’s why films like The Room, Troll 2, Plan 9 From Outer Space, Battlefield Earth and 90% of M. Night Shyamalan’s filmography have lasted so long in the cultural zeitgeist; people just love making fun of them, whether it’s the bad dialogue or the laughably incompetent filmmaking, which can make for some serious entertainment for anyone needing an unintentional laugh every now and then. It’s the same with any type of entertainment, including music; but while some people nowadays would be quick to state their ironic love for the likes of Rebecca Black, Soulja Boy or whoever the lead singer of Nickelback is, there was one person considered to be the grandmother of so-bad-it’s-good entertainment, and that would be New York socialite Florence Foster Jenkins who, upon embarking on a brief career as an opera singer in the 1940s, would quickly become known as being one of the worst singers of all time, yet would gain a particular popularity for it as well. 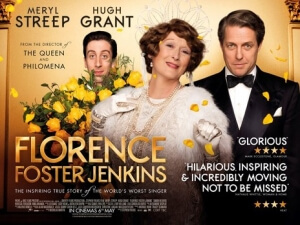 Naturally, they’ve made a movie based on her exploits, and while Florence Foster Jenkins may be about someone who was bad at what they did, the film is very good at showing the lighter side of the embarrassment, which makes for genuine crowd-pleasing entertainment that’s perfectly accessible to anyone wanting a natural laugh. The film, directed by Stephen Frears and scripted by Nicholas Martin, follows the eccentric “Madam Florence” (Meryl Streep), driven by her love for music and singing, embarking on her infamous vocal career while being supported by St. Clair Bayfield (Hugh Grant), her loving manager and sometimes caregiver to the aging heiress. Bayfield also hires young pianist Cosmé McMoon (Simon Helberg) to play for Madam Florence, only for McMoon to grow increasingly impatient with her awful singing, a fact which is masked by Bayfield and everyone around her as much as possible. When we do finally get to hear her sing, it is every bit as hilariously awful as you might imagine; but much like Ed Wood, the film doesn’t point and laugh at their incompetence but instead celebrates it in a way that really makes you want to cheer for her despite knowing that she is indeed terrible. The script retains a lovable and sincere tone throughout, refusing to portray anyone as an over-the-top caricature for the sake of comedy, and giving it a light but heartfelt sense of drama that can actually be very poignant in places. Frears gives Martin’s script a respectable do-over on the big screen, clearly taking some inspiration from the grand set-and-costume dramas and even screwball comedies of the time to give it a meticulously old-fashioned feel, giving it a punchy pace that maintains a feel-good attitude even in some of the weaker parts of the film, all the while revelling in the lovable nature of the characters and its overall message of doing what makes you happy. Streep is certainly a lot of fun in the role, and don’t be too surprised if she actually makes it onto various shortlists come next awards season (not necessarily because of her actual performance, but because Meryl Streep’s name spells out “Meryl Streep”); but it’s really the effortlessly charming Grant who impresses more as the most rounded and interesting character in the film. His Baynard is a guy who’s clearly doing what he can to make this woman who he so clearly loves happy, but is also conflicted with preserving the truth from her to a point where he even starts to alienate his live-in girlfriend Kathleen (Rebecca Ferguson) as a result, all the while never for a second letting his clear adoration for Jenkins be put aside for the greater good. He’s a complex and three-dimensional character, and Grant plays him beautifully in a performance that will surely silence anyone who claims he’s only good for Richard Curtis rom-coms and not much else. Helberg will also appease fans of The Big Bang Theory with his wide-eyed and amusingly awkward portrayal of McMoon, and we’re going to take a wild guess and say that he’s far less annoying here than he is on that show. Ultimately, aside from being a lively and uplifting crowd-pleaser that does its job wonderfully, Florence Foster Jenkins is a film that embraces the human spirit, no matter how little an impact it can actually make. It’s clear how much music means to Jenkins in the film, and through the various escapades in her short-lived career she never doubts her abilities because she’s doing what she loves to do, even if she’s not very good at it. That’s the sign of a true artist, someone who puts their all into their passion and makes the most of it because it’s what makes them feel invincible, other opinions be damned; in that sense, this film would make a great double-feature with Tim Burton’s Ed Wood, a film that does something very similar in highlighting a notoriously bad artist and showing how much they loved doing what they do, even if nobody else loves it. If we’re lucky, James Franco’s forthcoming film The Disaster Artist – which focuses on the making of The Room – will also take a similar path, and we would be left with a hilarious but truly inspirational trilogy of terrible artists doing what they love because they love doing it. And nobody, not even Madam Florence’s harshest critics, can fault them for that. Florence Foster Jenkins is a lovable crowd-pleaser that highlights the notoriously-awful opera singer but never once points and laughs at her lack of talent, instead – through strong performances and old-fashioned direction – embracing her musical passions as something to be rightfully admired instead of mocked endlessly.